In the world of adventure sports, GoPro cameras are probably the most popular tools used for capturing all the action. In fact, you'll often find them used for film and television production too thanks to their diminutive size and strong video capabilities. You don't even have to be an adventure junkie or a professional to appreciate the benefits of an action camera. With the right mounts and accessories, you could make even simple activities more fun. 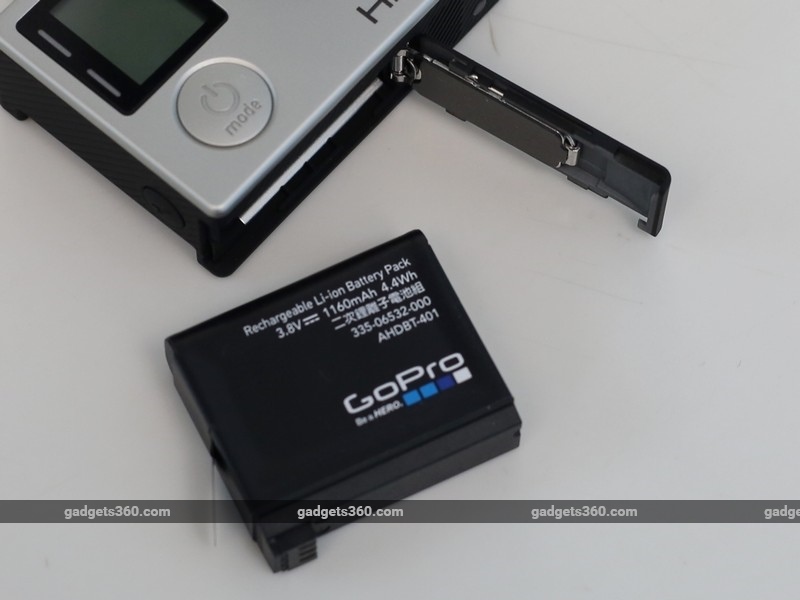 GoPro cameras have been around in India for a while now; however the company has recently entered into a partnership with Reliance Digital to officially expand its reach in the retail market too. 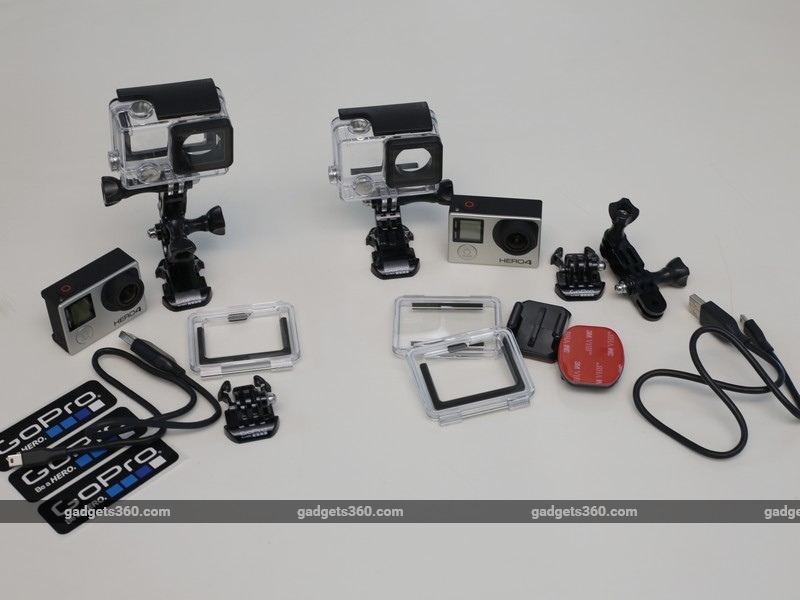 GoPro is bringing its latest Hero 4 series and Session action cameras to the Indian market, and today, we'll be testing out the twin Hero 4 brothers - the Black and the Silver. Both cameras are part of the company's flagship tier and differ only slightly in terms of features and pricing. They have identical dimensions and are each about the size of a matchbox, which makes them relatively inconspicuous. 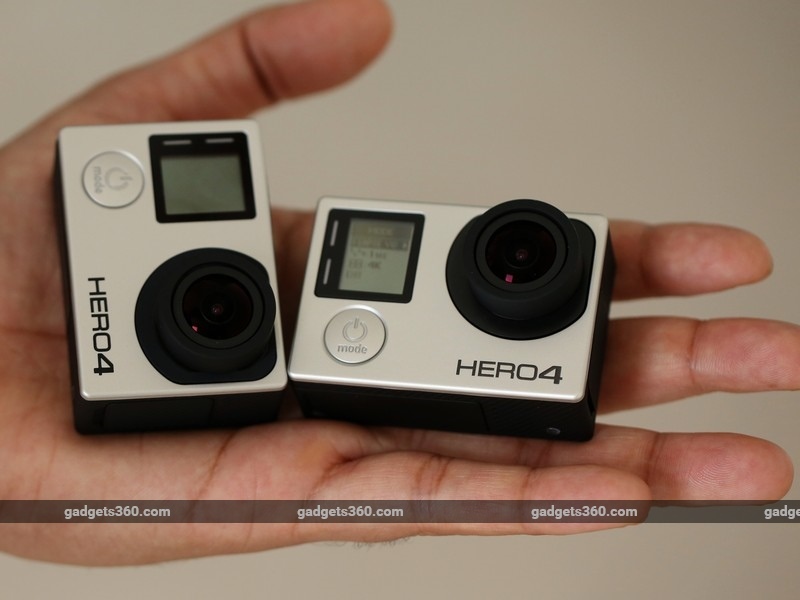 The Hero 4 Black is a tad heavier than the Silver but it's a negligible difference when you actually hold them both. Both models have a few features in common: a front-facing, non-backlit display with by a power/ mode button just below it; a shutter button on the top; a settings button on the left; and a Micro-HDMI port, a Mini-USB port, and a microSD card slot covered by a rubber flap on the right. Both also have removable batteries, which can be accessed from the bottom. There are three LED status lights placed along sides of the camera, so you can tell when it is recording even if the camera is placed at an obscure angle. You also get Wi-Fi/ Bluetooth and recording status LEDs just next to the display on the front. The cameras are extremely well built and feel like premium products, which they are. The rubber-clad bodies offer good grip too, in case you plan on using either of them without a waterproof housing. The big physical difference between the Black and the Silver is that the latter has a built-in touch display, which makes navigating menus a lot simpler. 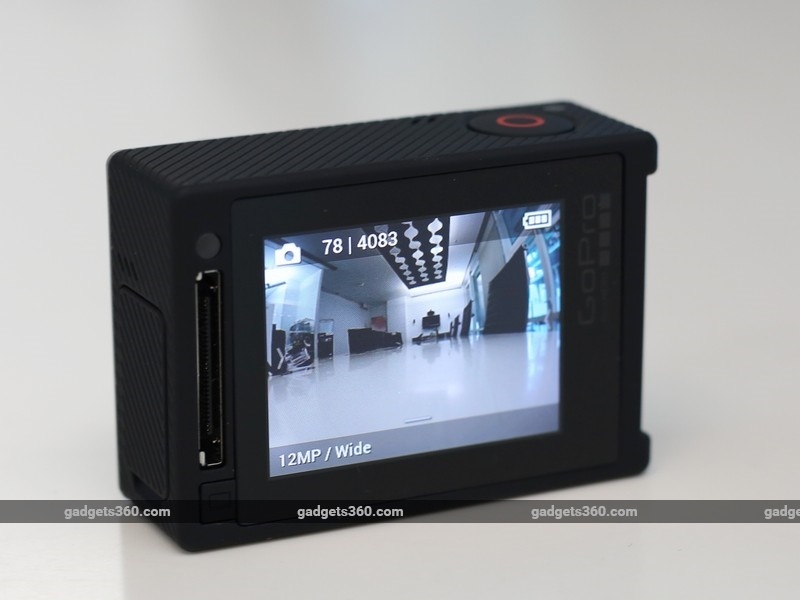 You can also use this display to frame shots and do basic video editing on the camera itself. However, both cameras still have a docking port on the back for attaching GoPro's external Touch BacPac display. The Hero 4 Silver and Black both come in fancy packaging. In each box, you get the standard waterproof housing, curved and flat adhesive mounts, quick release buckles, 3-way pivot arm, USB cable, and a skeleton backdoor for the housing. The Silver also comes with one additional backdoor which lets you use the touchscreen through the housing. The GoPros cannot be mounted on a tripod or anything for that matter without the housing, which is a bit unfortunate. It would have been nice to have had a tripod mount included in the box to get us started. The Hero 4 Silver and Black both sport 12-megapixel sensors with wide-angle lenses. Both support 4K video recording. However, the Black packs in a more powerful image processor which is how it's able to handle higher bit-rate video like 4K at 30fps, 4K SuperView (GoPro's version of dynamically stretching a 4:3 aspect video to 16:9 ratio), 1080p at 120fps, and 720p at 240fps. The Silver forgoes some SuperView resolutions above 1080p. Both cameras support microSD cards of up to 64GB in capacity. Photo capabilities are identical for both cameras, with a variable burst mode that can go as high as 30 frames per second, and timelapse intervals of 0.5 to 60 seconds. The cameras also feature Protune settings for both video and stills, which is like a manual mode for your GoPro, letting you adjust the white balance, colour, ISO range, sharpness and exposure compensation. You can control both cameras through the GoPro app on your phone, and also download and edit clips directly to your phone or another portable device for instant sharing. 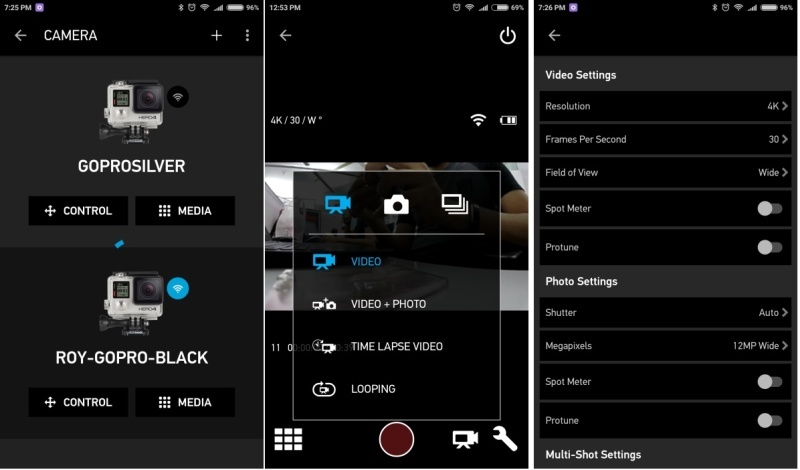 The app lets you control all settings, switch modes, and power the camera on or off. The main advantage is using it as a remote viewfinder for framing your shots. 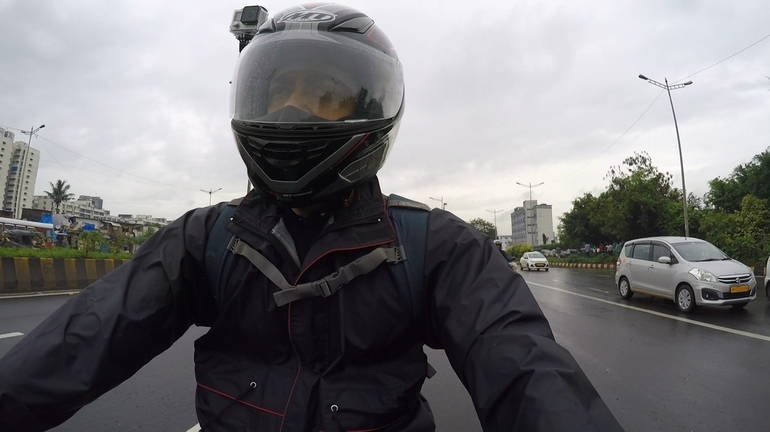 Setting up a GoPro Hero 4 with your phone is a simple process. Once paired, you can specify unique names for all your cameras in the app, which makes it easier to switch between them. Wi-Fi can be left on even when the camera is off so you can trigger it remotely and start shooting. A fair warning though: leaving the Wi-Fi on will drain the camera's battery a lot faster. Thankfully, you can quickly toggle this by holding the Settings button for a few seconds. We noticed that both cameras got warm pretty quickly, even without their housings on and in standby. If you have them in the housings, then expect them to get quite hot after a while. This doesn't affect the performance of the cameras in any way but it's worth noting nonetheless. Both cameras delivered excellent video quality in daylight and managed decent footage at night too. The level of detail is very good and so is colour reproduction. The framerate is also rock solid, even when shooting at 4K. There is noticeable barrel distortion in stills and videos, which cannot be avoided due to the fish-eye lens. Choosing a medium or narrow field of view in the settings helps a bit by cropping the frame, but that somewhat defeats the purpose of an action camera. You can fix this with the GoPro Studio application or even Adobe Premiere Pro, but again this will crop the video to a much tighter frame so there's a chance of losing important details. Another thing worth noting is that these cameras don't have any built-in stabilisation, so handheld footage can get quite shaky. QuickCapture is a real life-saver as it powers on a GoPro camera and starts shooting a video or timelapse immediately when you just press the shutter button once. You can do the same to stop recording and turn the camera off. 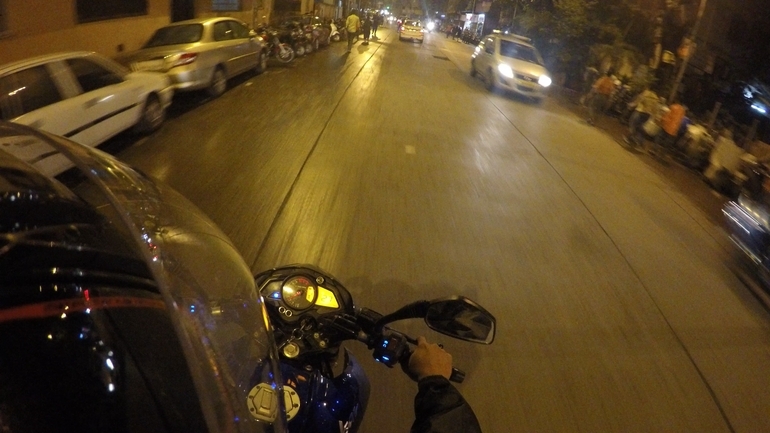 The new Hero 4 cameras also get new Night Photo and Night Lapse modes for enhancing details in low light. You can also highlight key moments while recording a video by holding the Settings button down for a few seconds. This adds a little marker in your video timeline so you can find that moments without having to scrub through hours of footage. 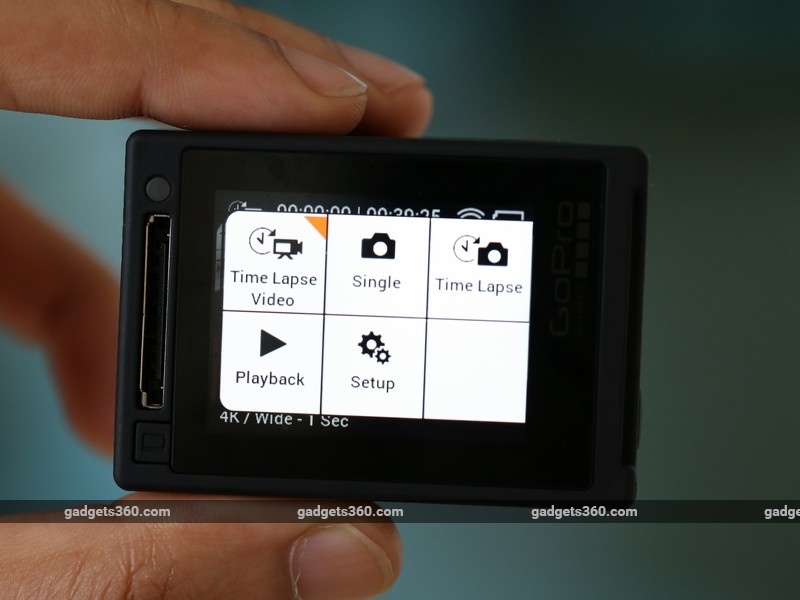 You can also loop video with different intervals, similar to a car's dash-cam system. Recording a timelapse video has never been easier. The Hero 4 models offer you a choice of photo or video timelapse modes. The former lets you capture a series of stills which are then stitched together as a video, while the latter shoots a video that's then sped up. You can vary the interval for frame captures in both modes. The video option lets you shoot at 4K and gives you smoother motion, which is needed when shooting things like the movements of clouds. Burst mode also works well, but if you use the high framerate (30fps) option and your subject is moving too fast, you'll end up with only a couple of frames that are actually usable. The Hero 4 Black and Silver are each fitted with a mono microphone, which is surprisingly sensitive and picks up little nuances even when in the waterproof casing. However, the quality of audio could be better. Only the Hero 4 Black supports the use of external mics in case audio quality is important to you. Battery life will vary depending on your type of use and what features you enable. Since Wi-Fi drains the battery quickly, it's best to switch it off when not needed. We found that we were able to record continuous 4K video on the Black for about 40 minutes, while the Silver kept going even after an hour when recording at 2.7K. 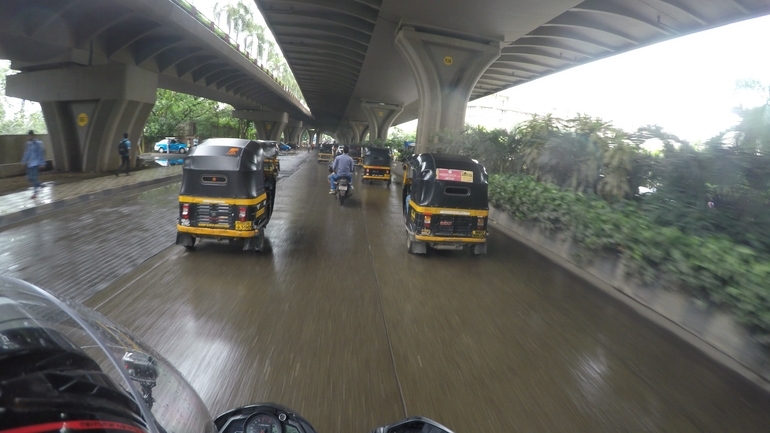 The GoPro Hero 4 Silver and Black action cameras are revered the world over, and we now know why. They are incredibly fun to use and pack a lot of technology in for their size. As far as premium action cameras go, they are easily two of the best on the market. 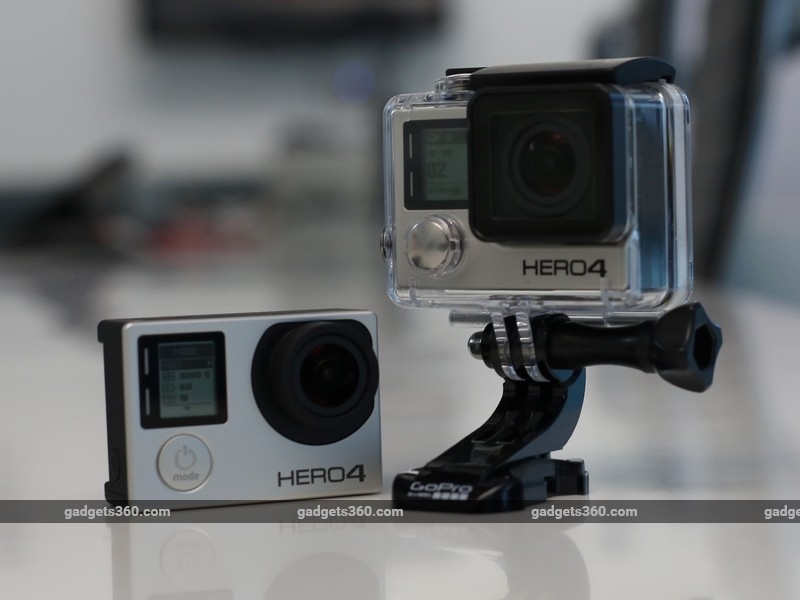 The Hero 4 Black is the better option in the GoPro lineup if you want 4K capabilities. It also supports external microphones, which means you can rig up a pretty good professional setup if you go all out. However, it's also the most expensive, and at Rs. 43,990, it'll largely be hard-core enthusiasts and industry professionals who'll be eyeing this one. 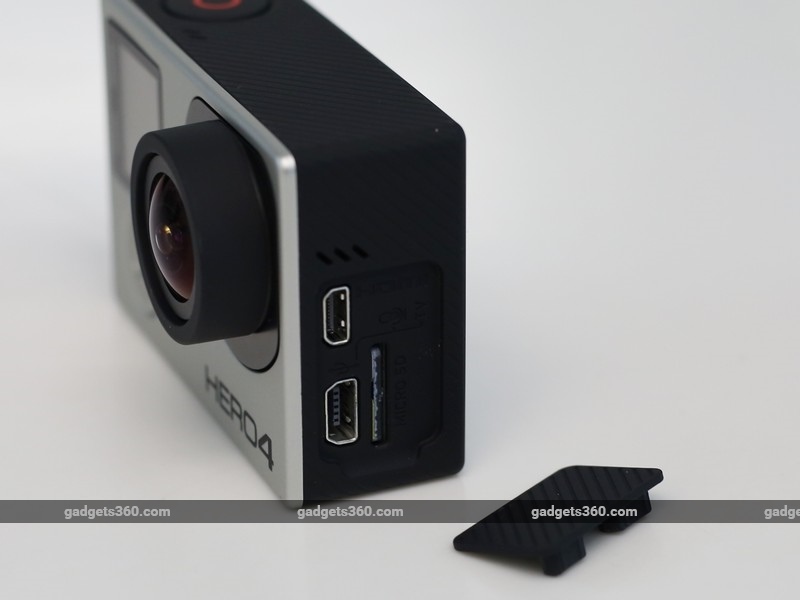 The Hero 4 Silver is a bit more affordable, but still comes at a premium. Although it lacks some of the higher video quality settings that the Black offers, it makes up for that with its built-in touch display. Despite their good performance, the cameras still lack some basic features which we feel should have been incorporated, especially given their premium prices. The first is the lack of a tripod mount - this is one accessory that many of us already have or can easily buy without spending a lot, so having the mount on the camera itself would have been really helpful. This way, you're not forced into using the casing all the time. Secondly, we would have liked some sort of stabilisation for video built into the camera. Hopefully we'll get all of this in future models.